This is my daughter Ashtrid. 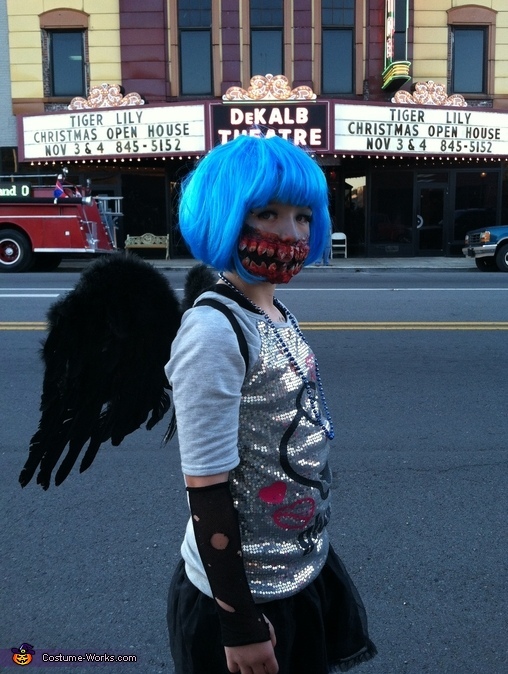 She wanted to be a Monster High girl for Halloween, so I told her yes, but we had to make it scary! My husband applied liquid latex above her mouth and on her cheeks, and then put down toliet tissue, more liquid latex, and continued to repeat this process until we had her face built up enough to make the teeth really pop out. We painted over the toliet paper a black color,and I got fake finger nails and cut them to a point, while he applied them to her face with liquid latex. It was a long process, but once it was all finished, we put on the the makeup, made her all bloody, and added all her accesories to finalize the costume! She was a hit, and not to mention turned out stunning! Awesome job! Very creative! Looks like a professional created this! You should be proud of yourselves!